This weekend is the Chinese Autumn Moon Festival also known as the Mid-Autumn Festival. It is based on the lunar calendar and is celebrated on month 8 day 15. This year it falls on Sunday, September 27th. The moon is said to be the brightest and fullest it will be all year at this time. It has been tradition for our family to have an Autumn Moon Festival dinner party every year since my daughters were adopted as babies from China. Ming’s roots are in China as well, as all pugs are. 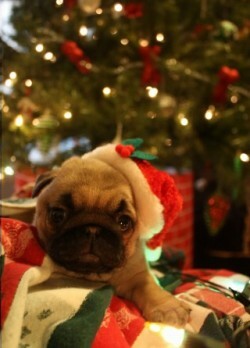 Pugs were companions to Chinese Emperors and are one of the oldest breeds of dogs. So, I thought, how fun to have a picture taken of Ming in the Moon! As part of the celebration we eat Moon Cakes. These are sweet pastries filled with different fillings like red bean paste, lotus seed paste, or a nut filling. They often also contain a hard boiled salted egg yolk that symbolizes the moon. I prefer them without the yolks, as they are an acquired taste. The moon cakes are round like the moon and symbolize togetherness. We used to order our delicious moon cakes from a bakery every year in New York City’s Chinatown. 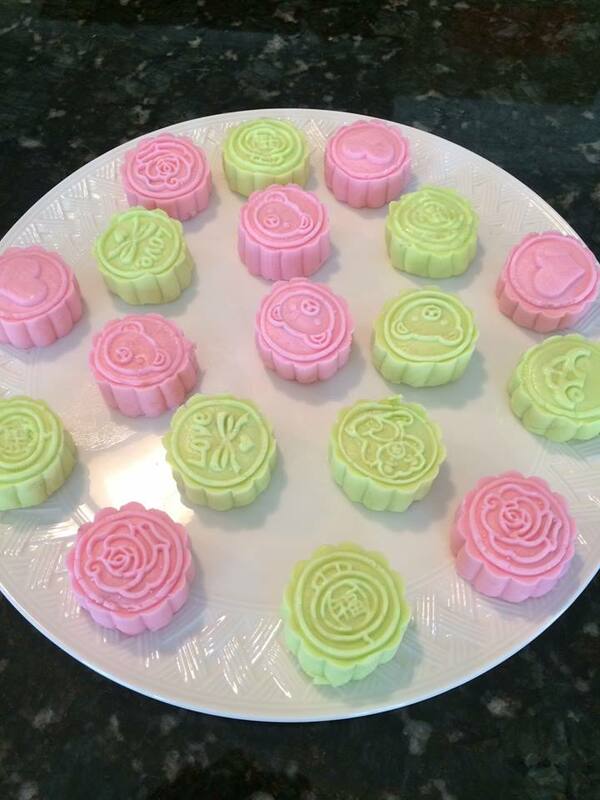 Moon Cakes are beautiful! Read more about them here. Since becoming gluten intolerant a few years ago, I have made a gluten free version at home instead. The recipe I make can be found on Kirbie’s Cravings. My older daughter, who is a nurse, came over today and spent the day with me in the kitchen prepping the dishes for the party. 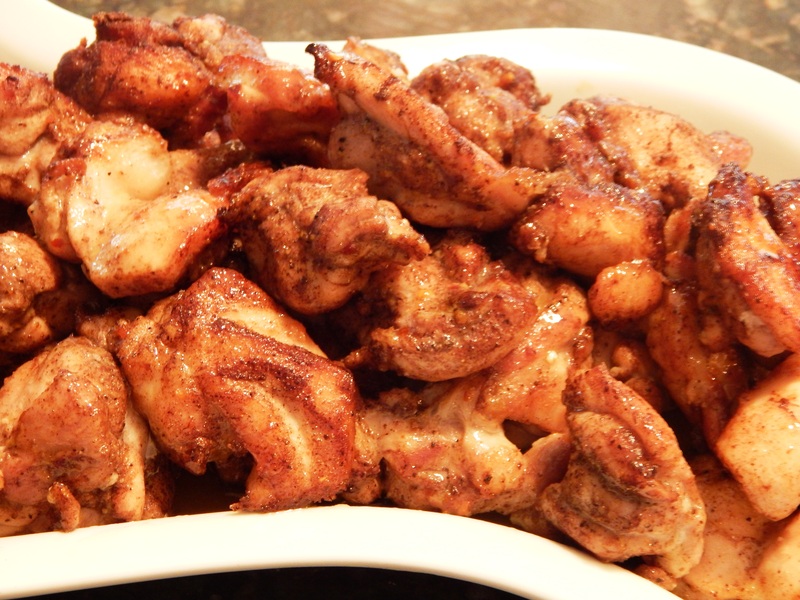 It will be a gluten free dinner using some of my favorite Paleo and Gluten Free Chinese Recipes, including the Chinese Five Spice Chicken Bites from my blog. Have you tried them yet? They are so easy and delicious. As part of the decorations, I made Crepe Paper Party Balls as a party favor for each guest. I found the idea on Martha Stewart’s website under Erin Furey’s craft videos. If you enjoy crafting, there are some great ideas there! I hope they are as fun to open as they were to make! After dinner we will go outside and see the full moon and release colorful Sky Lanterns. It should be a fun time, and Ming Ming will be right there also. She loves a good celebration! I know dogs technically don’t hibernate, and people don’t either, but sometimes we kinda do. With the shorter days of winter and colder weather here on the East Coast, Ming sleeps a lot more. She likes to find a patch of sunlight coming in through a window and camp out in the sunshine. Maybe she innately knows she needs her Vitamin D. She has a favorite blanket also. It is this red one. It came with her as a puppy. Did I mention she was a Christmas gift from my husband Doug? She is the first pet gift I had ever received. I can’t imagine not having Ming Ming, she has become such an important part of our family. Ming does quite a few tricks now, but never if you don’t have a treat in your hand. She will sit, shake, lie down, roll over and dance! Often, this is in succession in a wild frenetic attempt to obtain her treat. You have to see her dance! I have tried to fool her into thinking I have a treat in my hand and get her to do tricks, but she is too smart, I can’t fool her. You see, the way to Ming’s heart is through food, although she also enjoys a good scratch and a warm lap to sit in. 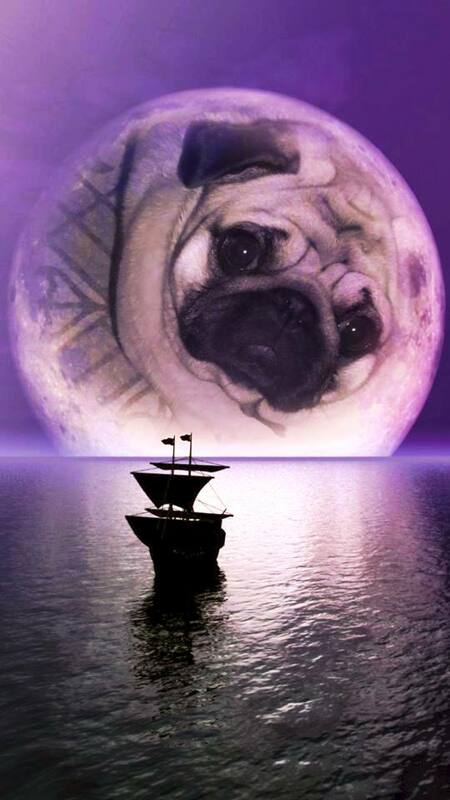 That is not the way with all dogs, or pugs, even though they are known to be gluts. 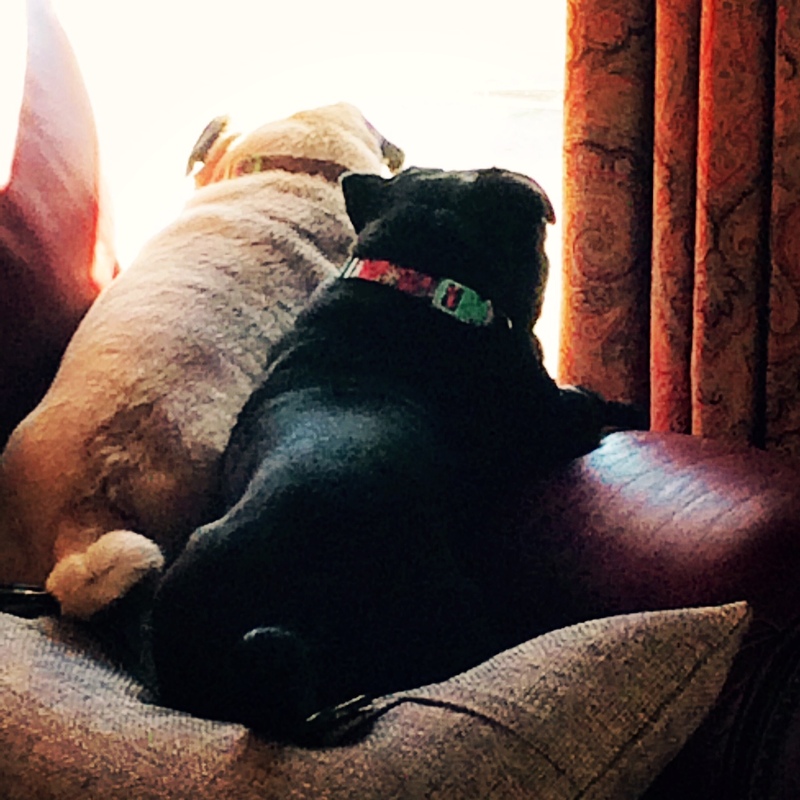 Our black pug, Lily, responds to praise and body contact. She will press against you tightly and close her eyes in ecstasy, no food involved. But for Ming, it is food. That is her love language. So Ming continues to enjoy a relaxing winter, with a daily walk outside, good food to eat, good company, a patch of sunshine, and her blanket. Spring will be here soon. We will Spring ahead in a few weeks, and she will come out of her hibernation mode. Time has flown by with Ming. She is my first small dog, and she is more wonderful than I could have imagined. We have had all sizes of dogs in our immediate and extended families, and each one is so individual in their personalities, likes and dislikes. My daughter had a teacher once who told the class “dogs do not have emotions”. I don’t know the basis of her statement, but she couldn’t be more wrong. Some of the emotions and feelings of dogs I know are , Lucy a black lab, who is afraid of thunderstorms, she also smiles and talks at her favorite people. Leila, a golden retriever, who gets upset when left alone and gives the cold shoulder upon her owner’s return, and Lily, the black pug at the left. Ming’s sister. 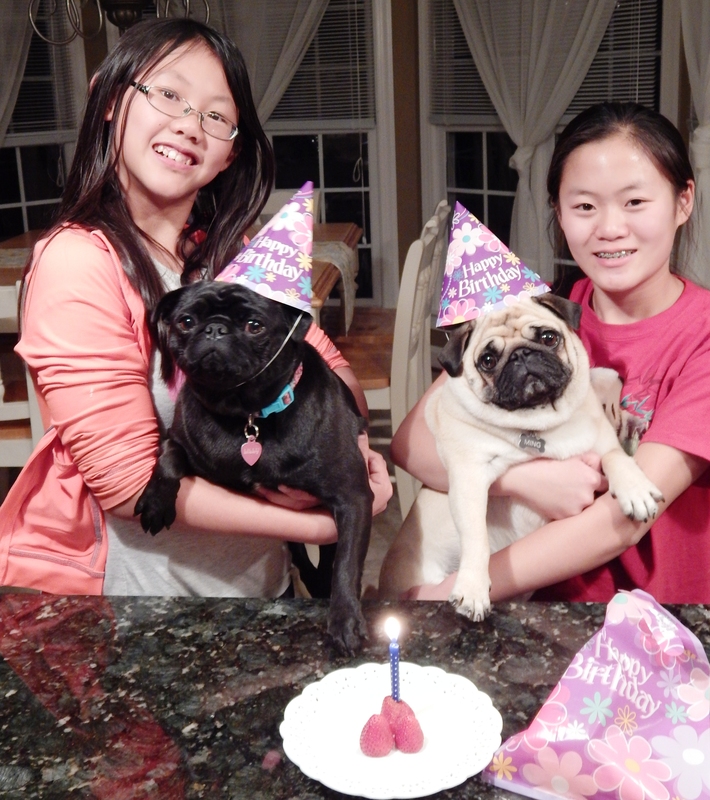 Lily is jealous in this photo because Ming is getting extra attention on her birthday. Lily gets to share the strawberries and dog presents too, but she can’t help being jealous a lot, which also makes her bossy of Ming. Ming tolerates Lily’s jealousy most of the time, because she loves Lily and is also confident in her place in the family. Lily was five months old when she became part of our family and had lacked attention the first five months, spending most of her time in a cage. She is a lovely, tail wagging girl who presses her body against you because she craves physical contact. Here is Ming when she was a bitty baby pug that fit in the palm of my hand. She was a Christmas gift from my husband. He came into the house with her tucked into his coat two days before Christmas, and said, “reach inside my coat for a surprise”. She was a fluffy warm ball of fur. Happy Birthday Ming, Ming. You have brought me three years of joy, extra love, cuddles and laughter! 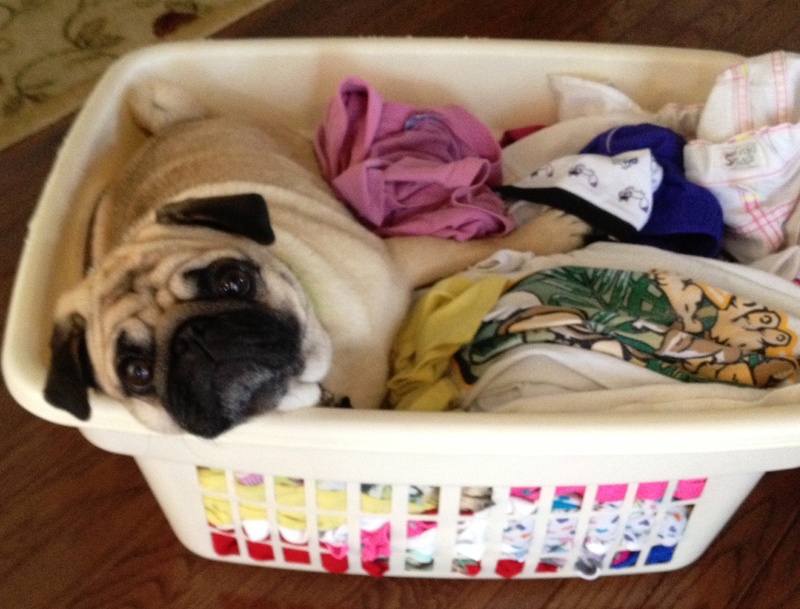 When there is a basket of warm laundry fresh from the dryer left unattended, Ming, Ming will find it! She has a special radar for warm things. 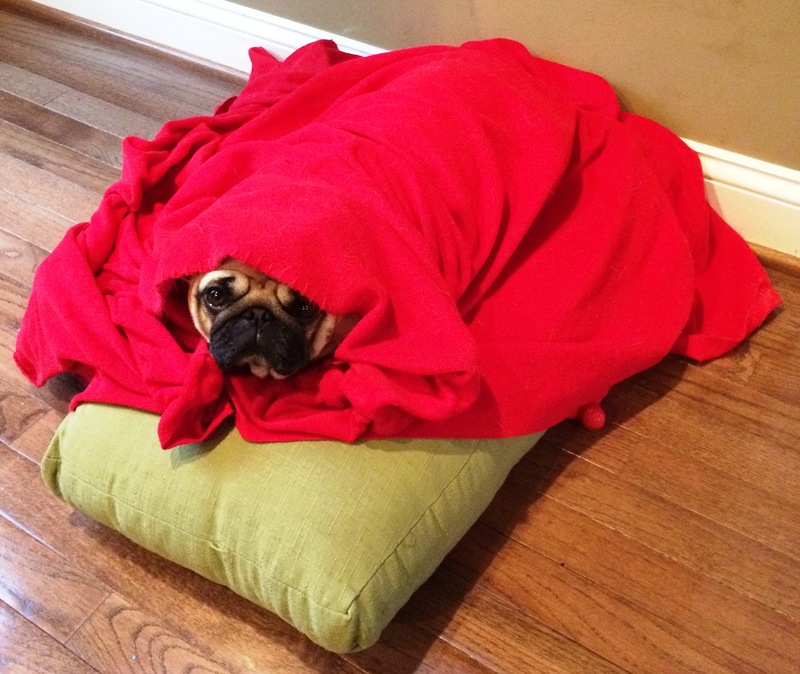 It is the perfect little bed of warm comfort, and she is a smart pug. She knows a good thing when she sees it. I love that Ming, Ming likes to be comfy and cozy, It makes her an excellent cuddler! I really enjoy my cuddle time with Ming, she is sweet and kind and never makes you feel guilty for lounging on the sofa and chilling out. She spins in circles of excitement when you head toward a comfy chair in hopes you will sit down so she can leap into your lap. She is a pug, and pugs love cuddle time! If you have a cuddler in the house, I would love to hear about them!